Building and maintaining a good credit score is one of the best moves you can make for your financial health. It might seem intimidating at first – our credit scoring system is definitely complex – but when it comes time to apply for a mortgage, you’ll be happy you made building a solid score a priority. But how does the picture change if you make a small income? As it turns out, not much. You don’t need to be a Rockefeller to achieve good credit. Take a look at the details below to learn how to build a great score, no matter how large or small your paycheck is. You’ll notice that income is not one of the factors used to determine your FICO score. This means that earning a big salary doesn’t equate to earning a high credit score. Even if you have a small income, you can succeed at scoring high, as long as you’re using the right strategies. It’s empowering to know that the steps to good credit are about financial behaviors, not the size of your bank balance. But what exactly should you be doing to get there? Above all, it’s important to start using a credit account responsibly as soon as you can. Proving to potential lenders that you can be trusted with borrowed money is the best way to start building your credit momentum. One of the easiest ways to do this is with a credit card. If you’re not earning much money, you might be shying away from plastic to avoid the temptation to overspend. But this will only stall your efforts to build good credit. However, if your earnings are limited, you might run into an obstacle: According to the CARD Act of 2009, credit card issuers must verify a customer’s ability to pay before approving his or her application. If you’re having a hard time qualifying for an unsecured card because of your income, consider a secured credit card instead. You’ll have to make a deposit to get the card, but every time you use it, you’re tapping a credit line. This means that your issuer is likely reporting your payment history to the credit bureaus. Assuming you’re responsible, this will help build your credit over time. If you’re not interested in getting a credit card, obtaining another type of loan to establish a credit history is a good idea. Again, you might have trouble getting approved if your income falls below the lender’s requirements. In this case, offering a big down payment or securing a cosigner might help you qualify. Once you’ve gained access to credit, keeping up with good habits is essential to building your score further. Specifically, you should focus on a few important behaviors. Payment history – Is the consumer making the minimum payment required on time every time? This accounts for 35% of the FICO score. Credit Utilization – Is the consumer keeping the balances on revolving credit (typically credit cards) below 30% of the available credit? This accounts for 30% of the FICO score. “A consumer can have … a high FICO score if they are following these two guidelines closely,” says Sprauve. In short, paying your bills on time and in full are the two most powerful things you can do to create and hold onto a good credit score. If you follow through with both of these guidelines throughout your life as a credit user, you’re likely to wind up with a great score. And just to be clear: Neither requires a big income. Spend and borrow within your means, and it will be a piece of cake to manage your payments properly. This, in turn, will put you on the path to a stellar score. The takeaway: Folks with small incomes have the same opportunity as their high-earning counterparts to build good credit. Use the tips above to get started today! 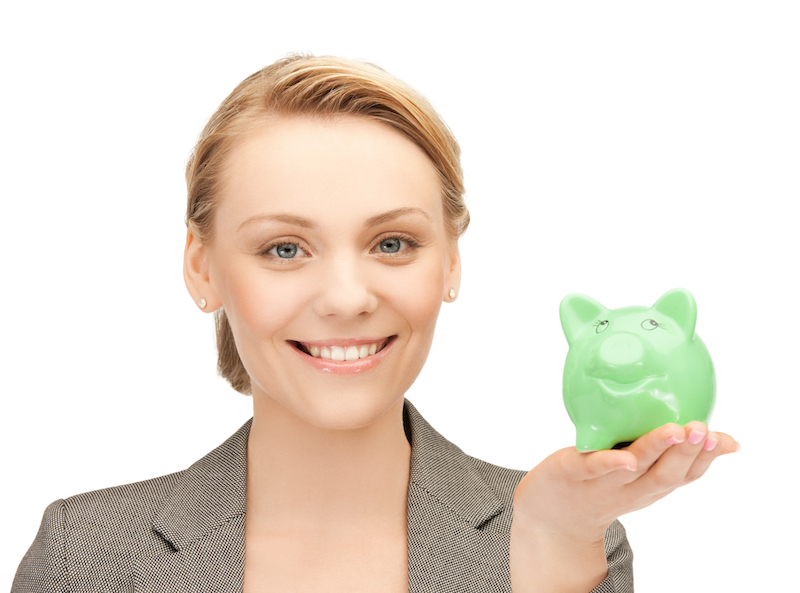 Woman with small piggy bank image via Shutterstock.